When you need to get wheel service done quickly, there’s no substitute for the LR-5T. This amazingly efficient low-rise lift holds up to 4,535-kg. It’s perfect for trucks and SUVs that many other lifts can’t handle. A low ​102 mm collapsed height accommodates most vehicles, including sports cars, race cars and larger trucks/SUVs. The minimal garage footprint means you can collapse your car lift without it getting in your way. This is perfect for home garages that want to reduce clutter in a tight space. The single-point safety release and dead-man style operation controls make this lift easy to operate and safe to use. The release during descent is instantaneous, smooth and perfectly level. A durable, leak-proof hydraulic cylinder with flow divider ensures even ascents and descents with every use. This is the same cylinder technology that supports all BendPak lift designs. 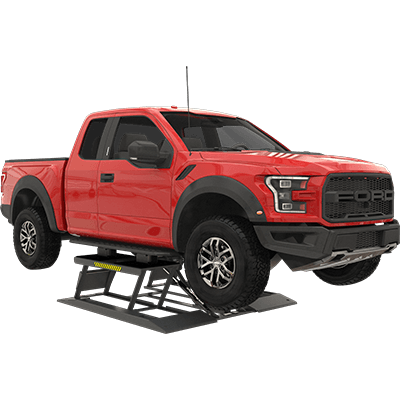 In our minds, low-rise pad lifts deserve the same rugged equipment as any other car ​lift, so we treat them that way. Others charge extra for these necessary adapters, but they're standard with every low-rise scissor lift purchase you make. There’s no point in having you open your car ​lift installed without all the pieces needed to operate it, is there? Only use BendPak’s durable treaded rubber lift blocks when operating our low-rise pad lifts. They’re more supportive and longer-lasting than many competing lift blocks. In fact, some companies use dinky rubber padding on their low-rise lifts, which rips and tears during use. Hardly a good idea.